Christmas, 1864 The valiant Army of Tennessee had been smashed and its tattered remnants were in full retreat as they were closely pursued by General Thomas’ Army of the Cumberland. The odd dispatch was met with some derision at division headquarters, but the divisional commander wrote a prescription to cure his brigade commander’s ailment: three regiments of infantry and a battery of Rodman guns. Far more formidable than General Debility that December, however, was General Winter. You may not have heard of General Winter before, yet this general was the most effective presence on the field of battle during the Civil War, more so than any field commander North or South. Winter influenced the outcome of many major battles. In the campaigns of the Western Theatre, in particular, General Winter played a commanding role. 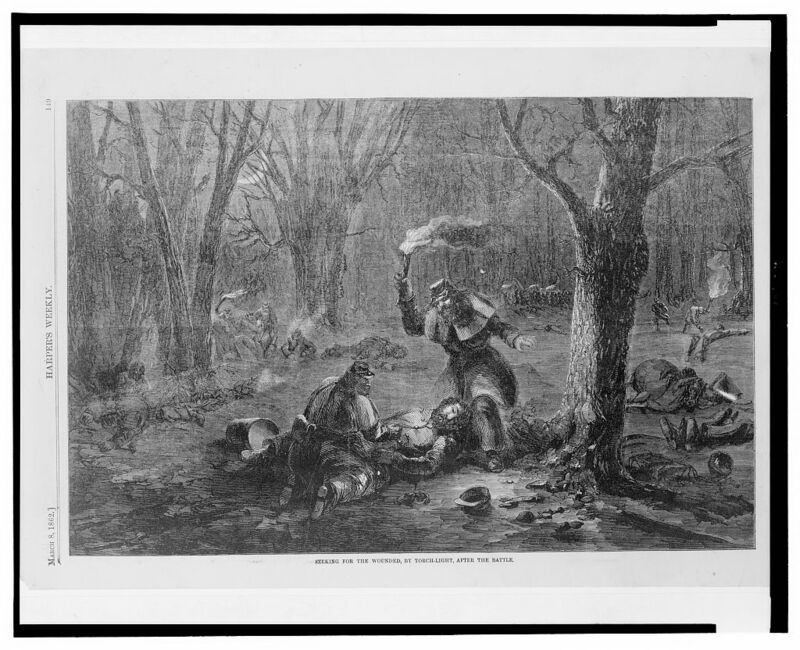 Reading many of the soldier’s accounts of the era, one gets the impression that the Army of the Potomac during the winter months simply hunkered down in their comfortable quarters surrounding Washington, DC and waited until life was more pleasant in the field. General McClellan did not want his precious boys getting their feet wet, or otherwise suffering discomfort and the easterners of his army appreciated him for preserving them from harm–so did the Confederates. The Rebel Army of Northern Virginia did not pass the winter in such luxury, but they also chose not to go on the offensive when the weather turned cold. In stark contrast, in the West, the Federals campaigned repeatedly in the midst of bone-chilling cold and foul winter weather, and their Butternut-clad foes did likewise. The war in the West did not stop simply because General Winter was abroad in the land. Looking for survivors on the battlefield. Many men who survived the battle, froze to death due to exposure. In January of 1862, for example, General Grant led the expedition against Confederate fortresses of Forts Donelson and Henry. It was bitter cold that winter and the Rebel troops were inadequately clothed. During the siege, the Union troops who fell assaulting Fort Donelson were caught out in the open between the opposing lines. The cries of the wounded, exposed and freezing, tore at the hearts of their comrades who were unable to rescue them. Many who could have survived otherwise died of exposure. 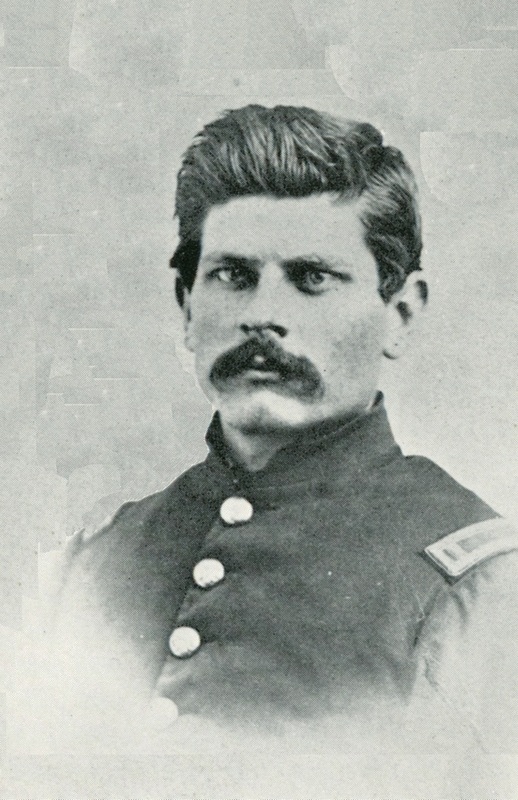 Lt. Ambrose Bierce, future journalist, editor and author, fought at Stones River & Nashville. At the Battle of Stone’s River in late December of 1862, both sides were also affected by the bitter cold. 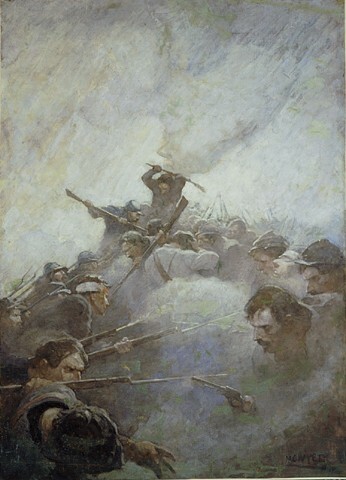 On the night of the first day’s fight, the Federal Army of the Cumberland was forbidden to light any fires, lest the enemy use them for target practice; to add to the misery, most troops had shed their backpacks containing blankets in the chaos of battle and Rebel cavalry had destroyed most of the wagons containing tents. But it was the wounded left on the field after the first day’s fight who suffered the most. Ambrose Bierce graphically described the situation in a forgotten small piece called “A Cold Night.” Men on both sides, wounded and unable to move, froze to death in the dark. However, the Federals too were affected by the winter weather in December of 1864. Although General Thomas had gathered together a mighty army to counter Hood’s Confederates, his counterattack had to be delayed. A terrible ice storm hit the city in the early part of December, making all roads impassable for his cavalry, without which Thomas was unable to attack. While waiting for the roads the thaw out, General Thomas, the “Rock of Chickamauga” was almost sacked by Grant, who sitting in comfort back east, accused Thomas of being “slow.” General Thomas came near to defeat, not due to General Hood, but due to General Winter. In the end, Thomas unleashed the Army of the Cumberland and achieved an overwhelming victory. 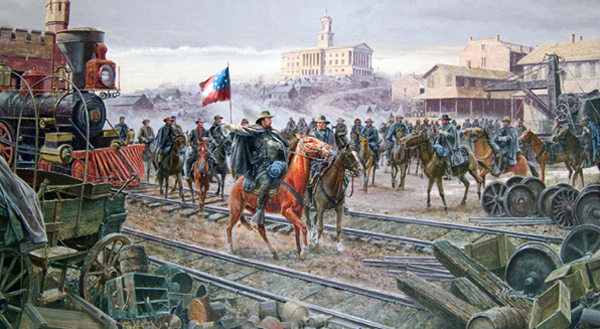 While most historians aver that the Civil War was won Appomattox in 1865, in truth the war was lost for the South at Nashville, in December of 1864. 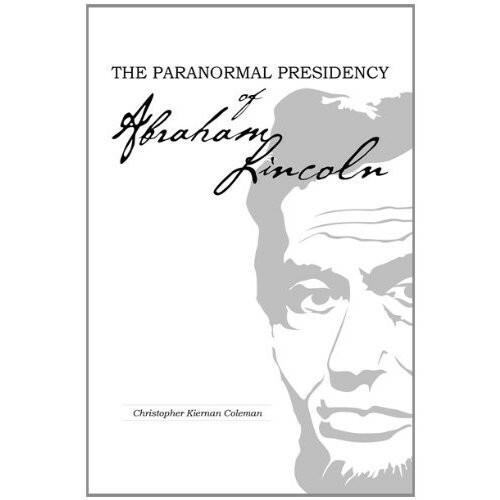 For more true tales of the Civil War, see Ghosts and Haunts of the Civil War and The Paranormal Presidency of Abraham Lincoln. Now in print, Ambrose Bierce and the Period of Honorable Strife is an in depth look at the famous author and his war experiences. Federal forces under General Grant traversed the isthmus separating the Tennessee and Cumberland Rivers and took the Rebels of Fort Donelson by surprise. A bloody battle ensued. 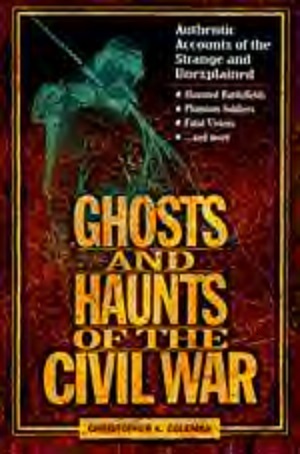 In both Ghosts and Haunts of the Civil War and Strange Tales of the Dark and Bloody Ground, I chronicled several different hauntings related to the Battle of Shiloh. But before Shioh were Donelson and Henry. Forts Donelson and Henry were the twin Confederate bastions which guarded the Tennessee and Cumberland Rivers on the border between Kentucky and Tennessee. The Rebels had fortified the two rivers where they came close to one another–called Land Between the Rivers back then; now, thanks to the TVA, it is Land Between the Lakes. Here in the winter of 1862, a Union amphibious force came to break the Confederate defenses. 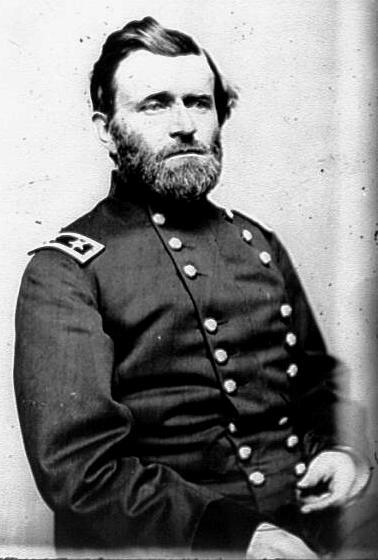 Led by General Ulysses S. Grant, the Yankees first bombarded Fort Henry on the Tennessee River into submission and then, in a bold move, Grant took a small force overland and besieged Fort Donelson from landward, catching the Johnnies off-guard. The Rebels had all their big guns pointing down-river, in the direction from which they thought the Yankee fleet would come. 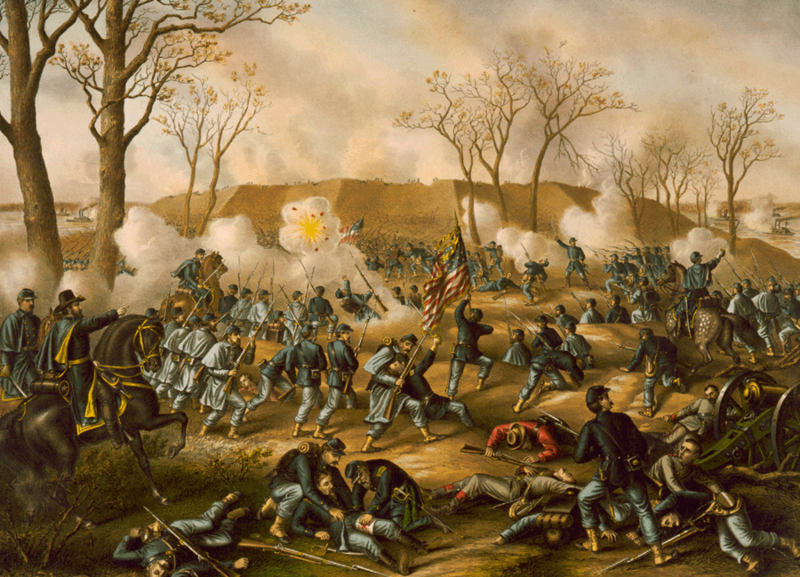 Fort Donelson falls to the Union army under Grant, opening the way for the Union occupation of the entire mid-South. It was a bitter cold winter and both sides suffered terribly. The wounded lay thick in the no man’s land between the two armies and suffered as much from the cold as they did from their wounds. Many died a slow and agonizing death. The Rebel troops, for their part, were ill-prepared for a winter campaign and suffered even more than the Yankees from the cold. 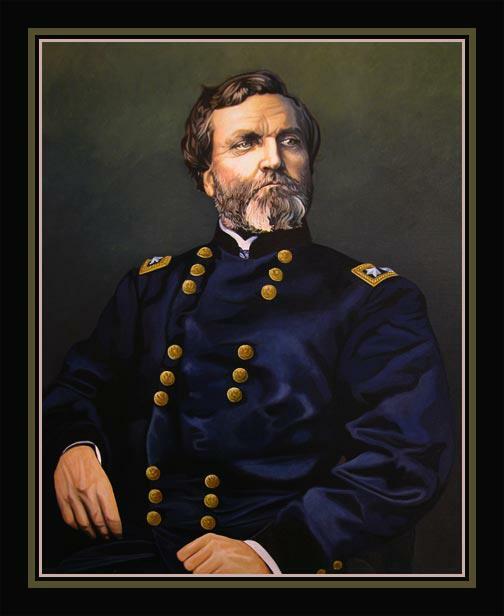 Ultimately, Grant bluffed the incompetent Rebel commanders into surrendering, thereby assuring his fame and opening the way for the Union to conquering the heartland of the Confederacy. General Ulysses S. Grant smoked, drank and liked to play poker. His skills at poker came in handy at Fort Donelson where he bluffed a superior force of Rebels into surrendering to his small army. Although the dead of both sides were quickly interred, their undead shades lingered–and they linger still at Land Between the Lakes. After my first book, Strange Tales of the Dark and Bloody Ground, which chronicled a few of Shiloh’s ghosts and haunts, and Ghosts and Haunts of the Civil War, where I covered more Shiloh ghosts and also a tale relating to General Grant, I had occasion to talk with several re-enactors who had camped at Fort Donelson at various times, trying to re-create conditions as close to January, 1862, as they could. Another re-enactor told of performing picket duty at night while his unit was there. 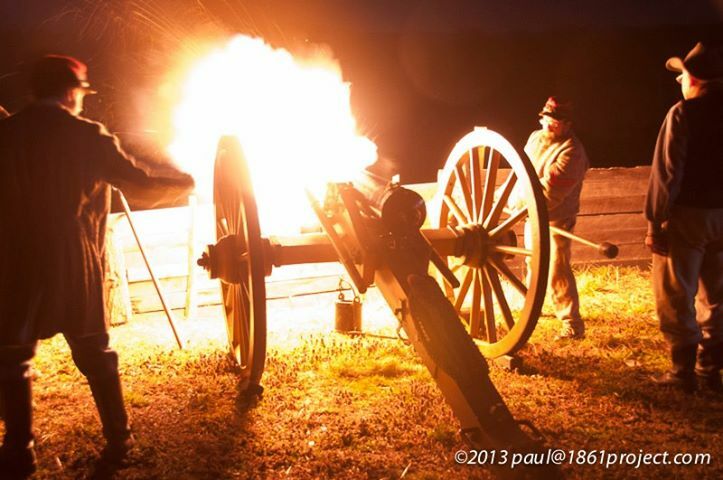 Many re-enactors try to get into the spirit of the period, not just for visitors during the day, but at night as well. An onlooker might well mistake them for the real thing. This re-enactor was on duty late at night when he saw a light coming up the hill in the distance. The dim glow grew larger and larger as it approached him and at first he could not make out what it was. Then it came close and passed him; in the eerie glow he could see the torso and head of a man–seemingly an officer, wearing a broad-brimmed hat and smoking an old-fashioned stogie; it was the phantom cigar that illumined the figure. It almost seemed as if the phantom officer were making the rounds, checking on the bivouac to see all the guards were on duty. But the cigar-smoking figure was no re-enactor; he had no lower body, just a materialized torso and be-hatted head. Was it the ghost of General Grant? Or was it the shade of some other tobacco-loving commander, North or South? Who knows? Shiloh. Union troops on April 7 recapturing Federal artillery lost to the Rebels in the previous day’s defeat. Print by Alonzo Chappel. 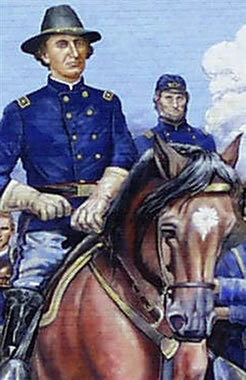 General Lewis Wallace would have arrived on the battlefield of Shiloh earlier in the day, had it not been for Grant’s own delay in sending for him. Lewis Wallace came from a political background, much as had William Wallace. 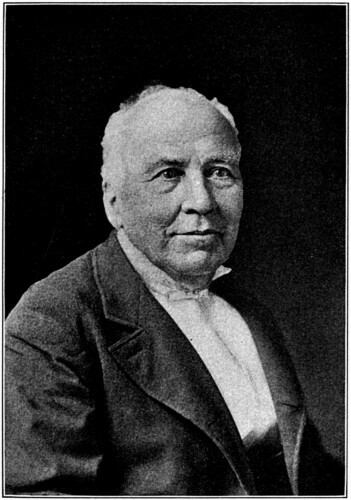 His father had been a successful lawyer and jurist and later served as Lieutenant Governor and then Governor of Indiana. Lewis followed in his father’s footsteps and became a lawyer in his turn. Lew Wallace was active in Indiana politics but remained a Democrat even when Oliver Morton, disenchanted with the party’s growing appeasement of the militant pro-slavery Southern wing, bolted the party and joined the new Republican Party. 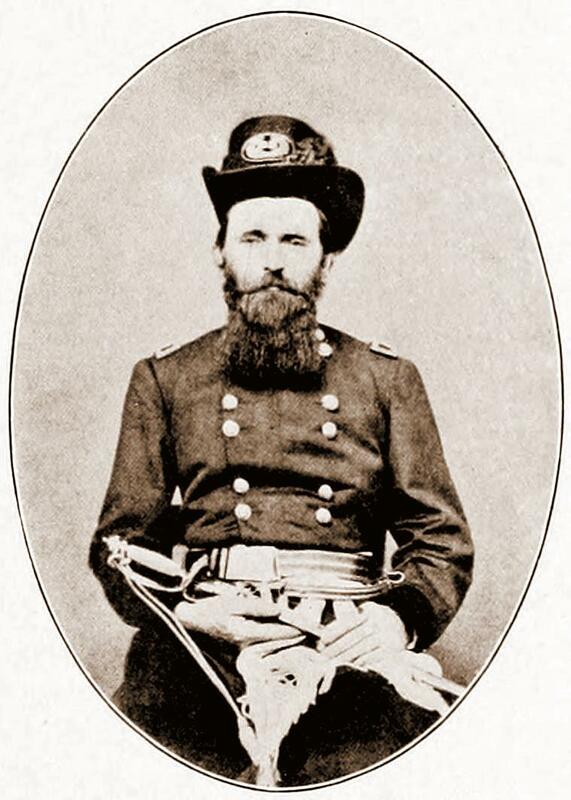 Lew Wallace’s career, like William Wallace’s, was interrupted by service in the Mexican War, where he served in the 1st Indiana Volunteer Infantry. However, when Lew witnessed the Lincoln-Douglas debates, he was greatly impressed by Lincoln’s performance–far more so than that of Stephen Douglas’s. 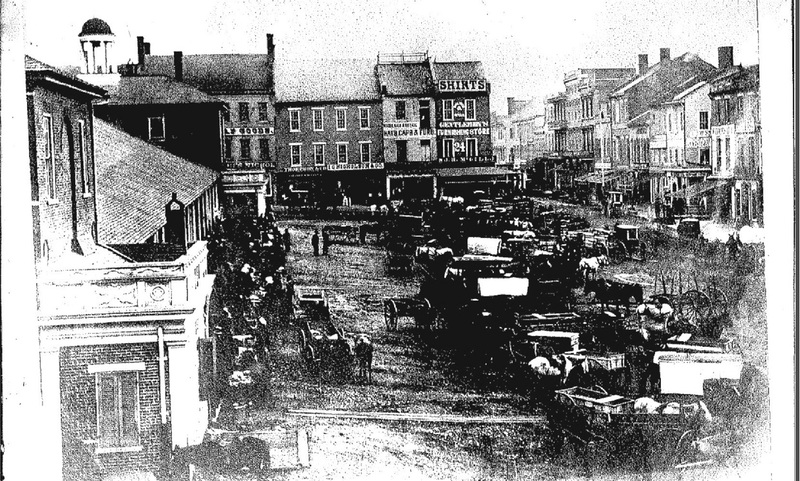 Witnessing the growing sectarian division in the country, Lew even organized a militia company–The Crawfordsville Guards Independent Militia–in Indiana several years before the outbreak of war, looking towards the day it would be needed to help preserve the Union. After the Election of 186O, as it became obvious that it was pro-slavery militants who were actually going to precipitate a civil war, Lew Wallace finally threw his lot in with the Republicans. Lew was what was called a “War Democrat.” Wallace went to Governor Oliver Morton to volunteer his services for the Union. Initially, Wallace was made Adjutant General and put in charge of helping organize the masses of recruits flooding into the training camps throughout Indiana. Lew was then given commission as Colonel of the 11th Indiana Volunteer Infantry and dispatched with his command to help liberate western Virginia (later West Virginia). The core of Wallace’s regiment consisted of his old company of volunteers, now expanded to a full regiment of zouaves. 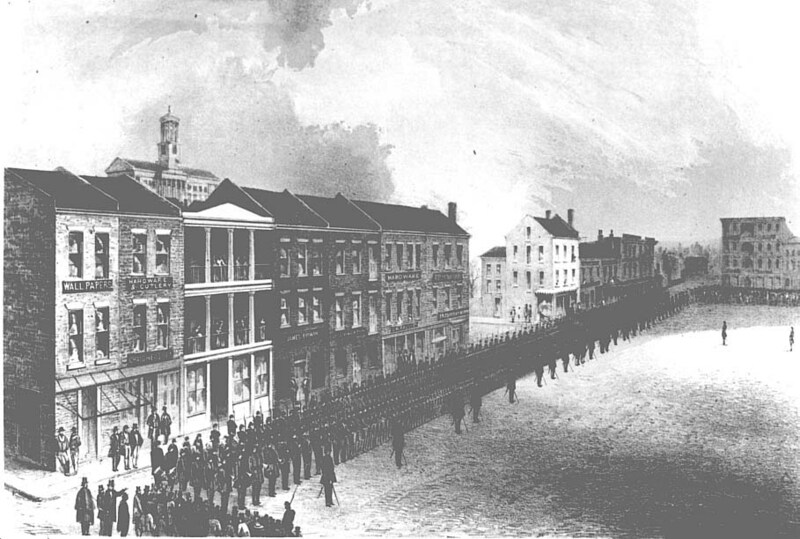 After seeing some brief skirmishing in Virginia, the regiment’s term of enlistment expired, but it was soon replaced by a three year regiment. In September, however, Colonel Lew was promoted to general and given a brigade to command. In February, 1862, Brigadier Lew Wallace took part in the expedition to attack the Confederate forts guarding the Cumberland and Tennessee Rivers on the border between Kentucky and Tennessee. Now part of General Smith’s division, Wallace’s brigade was at first given the passive role of garrisoning Fort Heiman, an unoccupied Rebel defense across from Fort Henry, which had been blasted into submission by Flag Officer Foote’s flotilla of gunboats. Soon, however, Grant precipitous advance on Fort Donelson necessitated his calling up Wallace’s unit to close the siege of the Rebel stronghold. 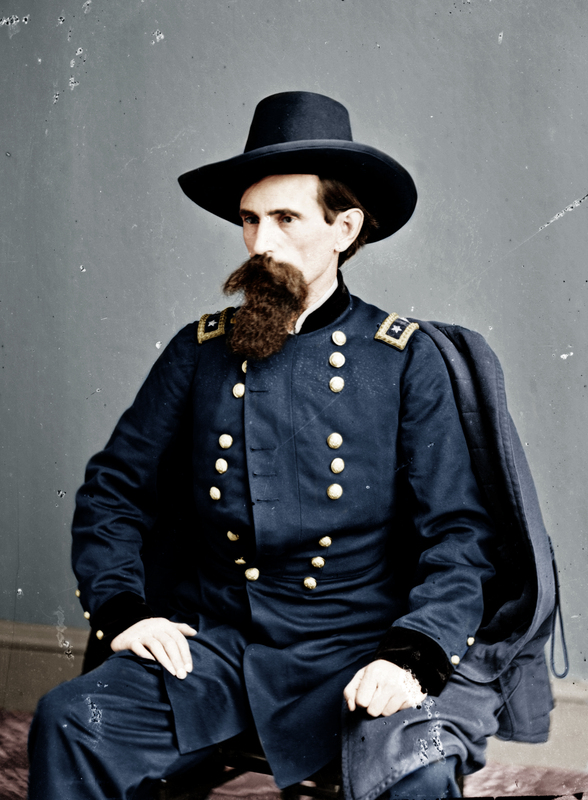 Although told not to take offensive action by Grant, General Wallace, now in charge of a full division, realized that nearby Federal troops were about to be overrun and, against orders, advanced to prevent an enemy breakthrough. He arrived to find General William Wallace’s outnumbered troops falling back and rushed to their rescue, saving the day. The Confederate counter-attack a failure, the enemy inside Fort Donelson soon surrendered to Grant. 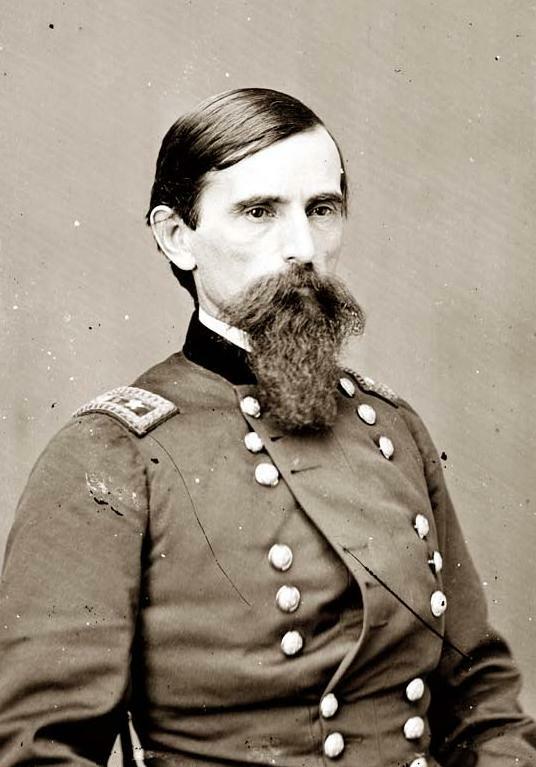 After the successful conclusion of the Donelson Campaign, Lew Wallace found himself promoted to Major General and in command of a division on a permanent basis. He was soon dispatched up the Tennessee River where the next campaign, aimed against the strategic rail junction of Corinth, Mississippi, was starting to take shape. Lew’s first mission was to cut the Mobile and Ohio Railroad north of Corinth, even as Sherman’s division was to cut the railroad south of the city. Wallace’s mission was a success and he returned to his temporary camp along the Tennessee. General Lew Wallace expected an advance on Corinth proper would follow almost immediately as that post was still weakly held. But it was not to be. Instead, General Henry Halleck, the departmental commander–nicknamed “Old Brains”– had decided to wait and have both Grant and General Buell’s armies rendezvous near Savannah, Tennessee, before moving against Corinth. 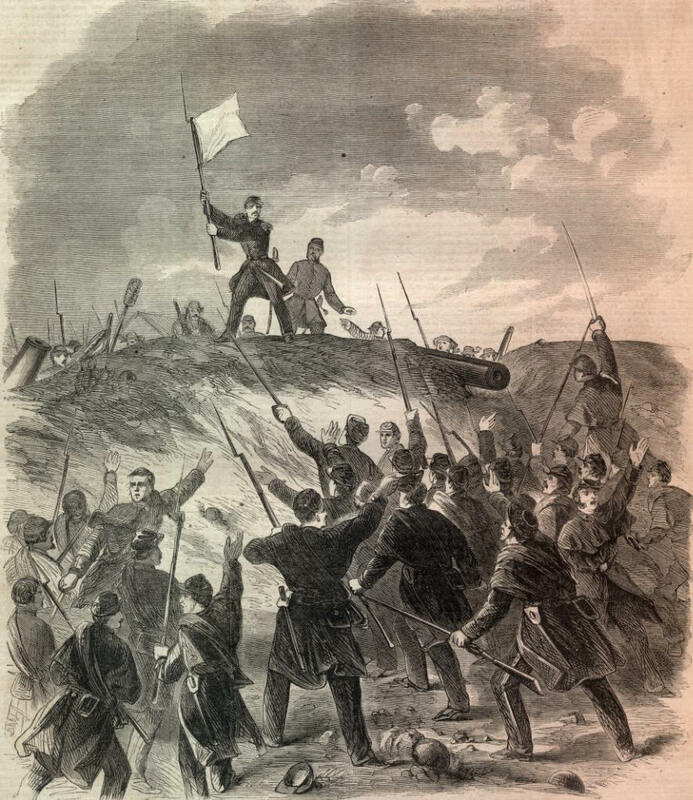 In the wake of the spectacular victory at Fort Donelson and the fall of Nashville, Wallace’s superiors believed the Rebellion was all but over. Wallace’s temporary advance base at Crump’s Landing was therefore made his division’s bivouac, as he awaited the rest of the Union forces to accumulate further downriver. As the bulk of the army gathered at Pittsburg Landing, some six to eight miles distant, Lew Wallace feared that his isolated division was vulnerable to enemy attack. Wallace deployed his brigades in depth, even as he sent out cavalry patrols and scouts (spies) to reconnoiter the countryside. Wallace also familiarized himself with the roads in the area and set work details repairing all the roads and bridges leading to Pittsburg Landing. Unfortunately, Generals Sherman and Grant were not so diligent in scouting and patrolling, nor in constructing roads to link the separated sections of their main camps at Pittsburg Landing. Of redoubts and barricades, there were none built by Grant to slow an enemy attack. 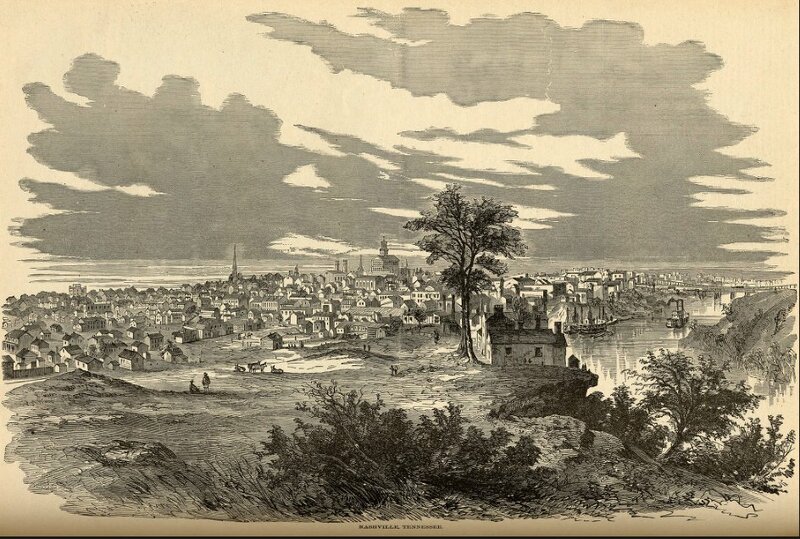 Several days before the April 6 attack, Lew Wallace’s spies reported a major movement of the Confederate Army from Corinth, headed for Pittsburg Landing. Lew Wallace immediately sent a dispatch to Grant, which should have been in Grant’s hand no later than the morning of the 5th of April. In his memoirs, Wallace gives Grant “the benefit of the doubt” as to whether or not Grant received the dispatch. In any case, Wallace informed his brigade commanders to make ready to move on short notice, expecting an attack at any time. In the actual event, on the morning of April 6th, although Grant and Sherman were not technically surprised—several frontline units had tried to warn their superiors to no avail—in fact the Confederates caught them unawares and totally unprepared. Chaos characterized the first day’s fighting at Shiloh, with Union camps being overrun and successive lines of the Federals being outflanked. It was Grant’s indecision and vague orders, not Lew Wallace’s slowness, which caused his division to arrive late to the battlefield. It wasn’t until 11:30 a.m. that Wallace finally received Grant’s marching orders via one of Grant’s aides, who had translated Grant’s verbal orders into writing. Whether the written orders actually reflected Grant’s verbal intent has been the subject of dispute. General Wallace’s column was actually making good progress towards the battlefield, when a series of orderlies and aides came up from behind, with panicked instructions from Grant, urging Wallace to “hurry up.” Finally, Grant’s assistant adjutant, Major Rawlins, came up and under threat of being relieved, told Wallace he was on the “wrong road,” and to divert towards the low-lying road close to the river. 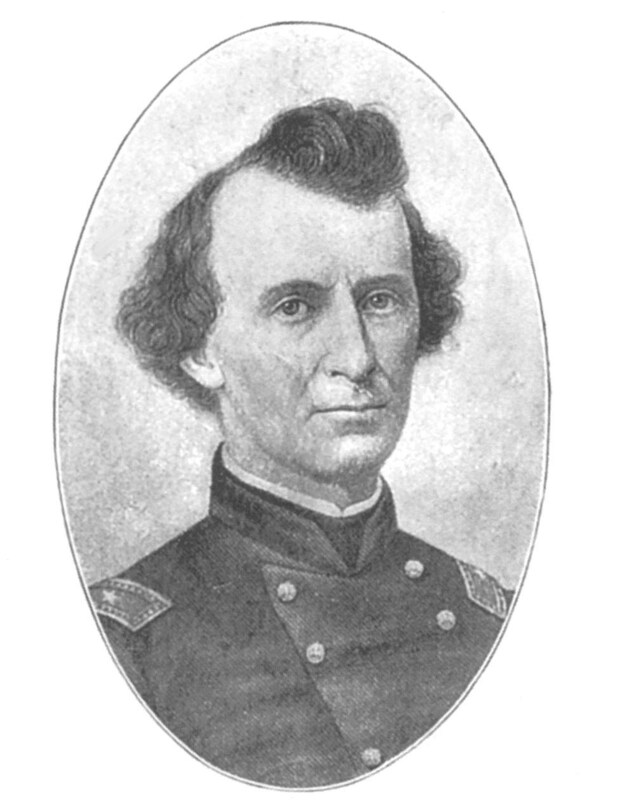 In fact, Wallace had long since surveyed all the roads towards Shiloh and was proceeding on the shortest route; it was a route that would put him on the right of Sherman’s original camp, where Grant’s original instructions ordered him to go. However, the Union forces had been forced backwards towards the river since the early morning and Wallace’s route would put him behind and on the flanks of the Confederate attackers—as it turns out, exactly where he would have been able to make a difference in the first day’s flight. However, taking Major Rawlins petulant demands as a direct order from Grant, General Lew turned his column around and marched it back to a road that would take the division southward to the sodden and marshy river route—a route which was in places covered with water as high as a horse’s breast. After making this detour, Wallace’s progress slowed to a crawl and his force was not able to reach the battlefield until after dark–after the end of the day’s fighting and too late to make a difference in the first day’s battle. Earlier that day, as General Lew Wallace awaited orders, the situation at Shiloh had gone from bad to worse, as the Union forces were repeatedly outflanked and pushed back towards the river. 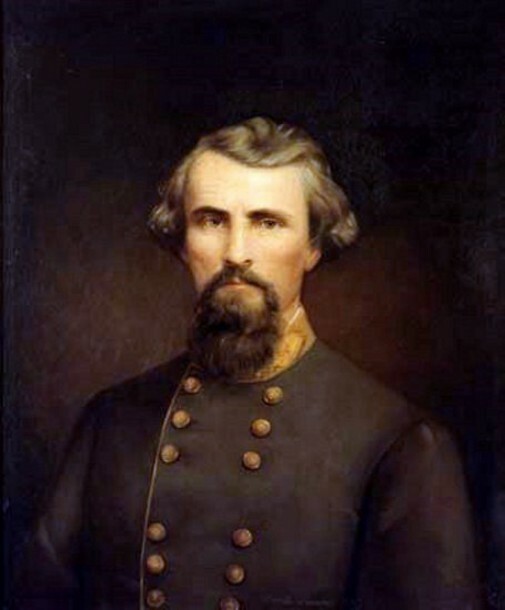 General William Wallace, by his defense of the Hornet’s Nest on April 6, helped delay the Confederate advance long enough to save the remnants of Grants army at Shiloh. William Wallace, now in charge of the Second Division, had his command’s bivouac close to the river. Nevertheless, as soon as William Wallace heard the distant sound of firing, he ordered the drummers to sound the “Long Roll,” mobilized his division and arrived close to the front in short order. 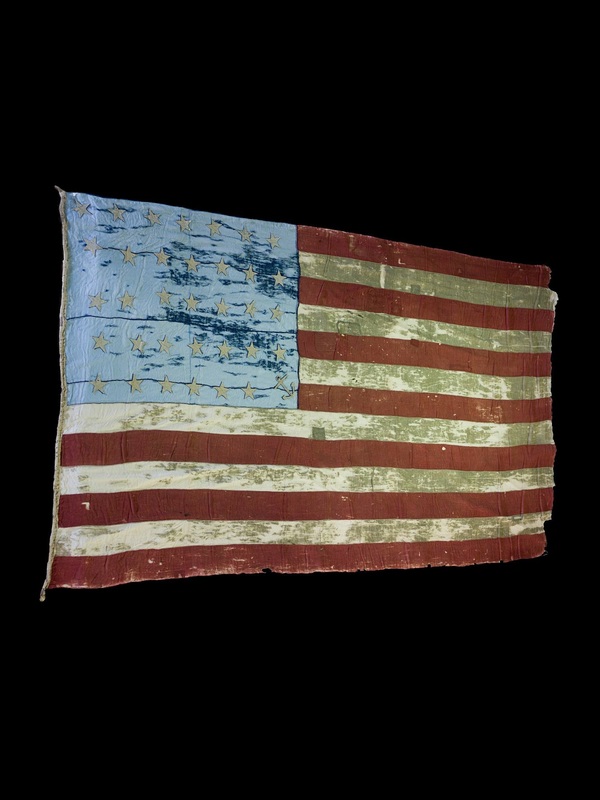 Initially, the Second Division was employed as a reserve, detaching units to the support of the frontline divisions that were desperately attempting to repulse the repeated Confederate attacks. However, because of a lack of unified command—each division fighting on its own front and lacking coordination from Grant—and a lack of prepared defenses to rally around, the Confederates were able to penetrate between the separated Union forces and flank them repeatedly. Whole regiments and even brigades of Federal troops disintegrated and fled to the rear—but not the men under William Wallace’s direct command. 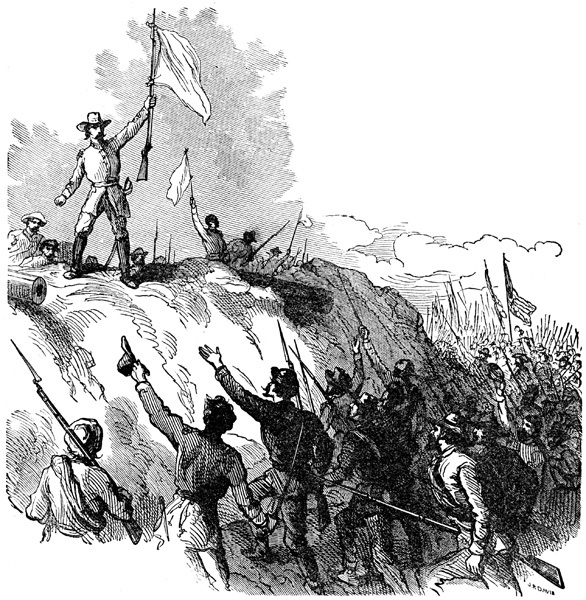 It was not until the afternoon that Wallace, along with the surviving fragments of General Prentiss’ division and miscellaneous units, were able to form a stable front on the crest of a thicket covered ridgeline with a shallow sunken road meandering along it—what the Rebels called “The Hornet’s Nest.” For a large part of the afternoon Wallace’s division, along with the other units, held back repeated Confederate attacks, drawing off Rebel units from other parts of the battlefield and allowing the beaten and demoralized survivors elsewhere to retreat to Pittsburg Landing, where they crowded the riverfront by the thousands—perhaps the tens of thousands. Finally, subjected to a massed artillery barrage and nearly surrounded, William Wallace ordered a fighting retreat. All was going well for the Second Division as it escaped the tightening noose. However, as he directed his men’s withdrawal, a sniper shot hit William Wallace in the head and he was left for dead as the retreat became a rout. The next day, General Lew Wallace launched a counterattack on the right on his own initiative, lacking any direct orders from Grant since the day before. Similarly, on the left of the field, General Don Carlos Buell’s troops also counterattacked. Supposedly, the survivors of the first day’s fight, compressed into the center of the semi-circular federal line defending the landing, also attacked—although by mid-afternoon on Monday, April 7th, General Buell’s extreme right was covering General Lew Wallace’s extreme left. 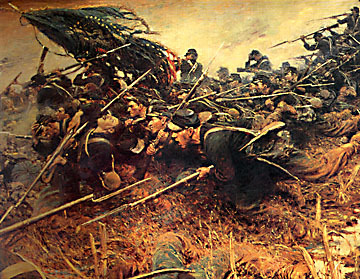 The action of the 7th—which Buell’s men forever after called “Buell’s Battle”—is what allowed Grant to claim victory in his reports and memoirs. In all the recriminations following the Battle of Shiloh, Lew Wallace was criticized as “going slow” on the 6th and becoming either confused or lost on his way to battle—none of which was true. General William Wallace, whose courage and rock-steady leadership in the face of overwhelming odds helped save Grant’s command, received scant recognition in all the reports of the battle. Due in large part to his fatal wounding and being unable to tell his version of the battle, William Wallace never received the full credit due him at Shiloh. As for Lew Wallace, while Grant ultimately exonerated him of any wrongdoing, his reputation remained under a shadow even after the war. The two Generals Wallace, both “political generals,” men committed to the cause and competent leaders in peace and war, each deserved far better of History than they have so far received. For more about William Wallace and his wife Ann and the Battle of Shiloh, see Chapter 12 of Ghosts and Haunts of the Civil War; for other, more unusual aspects of Shiloh and its aftermath, also see Chapter 11 of Ghosts and Haunts, as well as Chapter 31 of Strange Tales of the Dark and Bloody Ground. 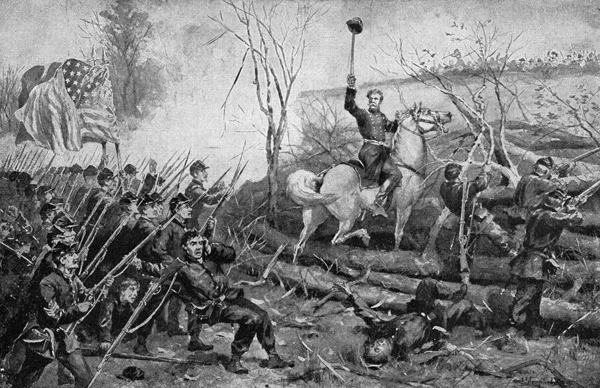 Ambrose Bierce was an eyewitness to Shiloh and his account of the battle is justly famous. For more on Shiloh and Bierce, see Ambrose Bierce and the Period of Honorable Strife. In all the chronicles, memoirs and histories of the war, then and now, some generals have, fairly or not, gotten a disproportionate share of attention. Of course, it is easy to see how Grant and Lee should get the lion’s share of ink. Yet no war is won—or lost—by just one man. Often the one who is hailed as victor in truth may owe his laurels to the efforts of those of lesser rank whose contribution to the cause has been overlooked or even deliberately slighted. Such is the case with the two generals Wallace. General William Hervy Lamme Wallace and General Lewis Wallace, although from different states and different backgrounds, in many ways followed a similar path to the war. Both were “political generals.” As many military historians come from a professional military background, there has been a tendency to look down on such military commanders; the “political general” is almost universally regarded as either incompetent, venal or vainglorious—or a combination of all three. Some political generals were unfit for high command. However, a civil war is in essence a political conflict, and men who are politically committed to their cause can often of great service on its behalf. Such were these two men. Conversely, a commander who possesses technical competence, yet has little appetite for the cause he serves can not only be of limited value, but may at times even harm the cause they ostensibly serve. William Wallace, named after the famous Scottish national hero, was born in Ohio but grew to manhood in Ogle County, Illinois. Young William attended the Rock River Seminary, a school of higher learning for young men, whose alumni also included John A. Rawlins, who would later rise to become General Grant’s Chief of Staff. After graduating from there in 1844, William resolved to pursue a career in the law and was fully intending to apprentice with the firm of Logan and Lincoln. On the way, however, he met the acquaintance of Judge T. Lyle Dickey—and his daughter Ann—and decided to clerk with that esteemed Illinois jurist. Earning his admission to the Illinois Bar, Wallace became friends with Abraham Lincoln and rubbed shoulders with many prominent lawyers and politicians of the day, many of them of like mind as Lincoln. Wallace and his wife attended the Lincoln-Douglas debate in 1858 that was held in Ottawa, Illinois. There is little question that William Wallace was a Lincoln man through and through. As a friend and associate of Lincoln, William Wallace tirelessly worked for the latter’s election and when secession came, William Wallace was quick to volunteer his services, becoming Colonel of the 11th Illinois Volunteer Infantry. Although most of 1861 was uneventful for Wallace, late in the year he saw action in the field, joining General Grant’s expedition against Forts Donelson and Henry and earning a promotion to brevet brigadier general. When Fort Henry on the Tennessee River felt easily to the Federal flotilla under Commodore Foote, General Grant resolved to march across the thin strip of land that separated it from Fort Donelson, which guarded the Cumberland River, and attack that fortress from landward. Wallace’s brigade was part of General McClernand’s division, assigned to the right flank of the besieging Federal force. In truth, General Grant’s force was smaller than the Confederate army he was besieging inside Fort Donelson, although the Rebel commanders did not know it. On February 15, however, the Confederates resolved to break the siege and escape southward towards Nashville, where they hoped to regroup and renew the fight. The brunt of the Rebel attack therefore fell on Grant’s right, where McClernand’s troops were blocking the roads southward to Nashville. Although attacked with overwhelming force, William Wallace’s regiments resisted valiantly, until at last, their ammunition exhausted, they were forced to retreat. Other brigades of McClernand’s division broke under the pressure of the assaults and fled in panic, but Wallace managed to keep his men together and fell back in good order. Still, the situation was critical, as the Rebels were on the verge of making good their escape; if they realized how weak Grant’s force truly was, they may even turn and overwhelm his vulnerable force. As fate would have it, however, as William Wallace led his battered brigade back, another Union force, fresh to the battle, was advancing to fill the gap. This was a hastily assembled division, made up in large part of troops transferred from General Buell’s Army of the Ohio and under the command of General Lewis Wallace. Leading the troops relieving William Wallace was General Lew Wallace. The two Generals Wallace exchanged brief courtesies, with General Lew directing William to his ammunition wagons to resupply, even as Lew Wallace’s troops advanced in battle formation to counter-attack. The Rebel breakthrough was blunted and then forced back by Lew Wallace’s men; General Grant’s victory at Fort Donelson was thus assured. 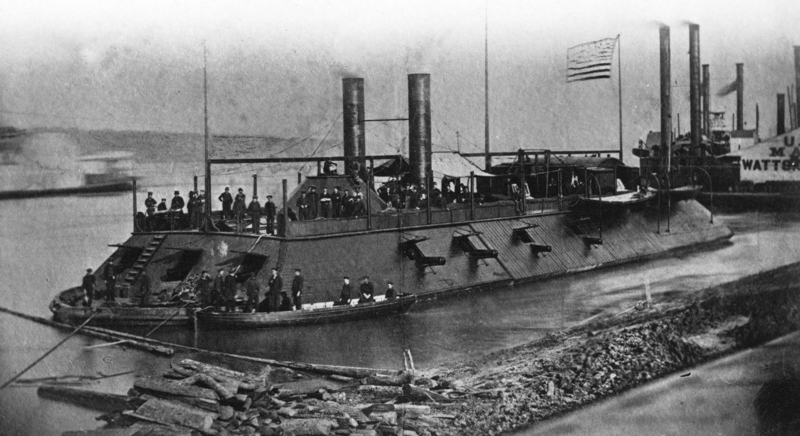 Thanks largely to the two Wallace’s, Grant earned his laurels as the victor of Forts Donelson and Henry. For more about General William Wallace and his wife Ann Wallace, see Strange Tales of the Dark and Bloody Ground. For more on General Buell and the Army of the Ohio, see Ambrose Bierce and the Period of Honorable Strife.